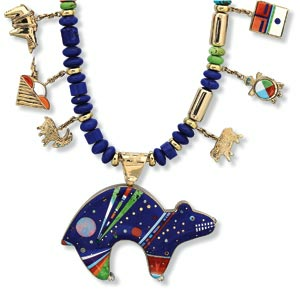 BEAR NECKLACE by Jesse Monongye of turquoise, coral, opal, lapis lazuli, dolomite, gaspeite, jet, shell, diamond, and eighteen karat gold; 2004. Ornament celebrates a unique art because its context is the human being. Our creative energies are drawn from an appreciation that what we make to adorn ourselves is a beautiful and meaningful expression of life. Our vision is rich in contemporary, ethnographic and ancient history, anthropology, and archaeology. We believe that we can help sustain a healthy and compassionate society when we know more about our own and other cultures. As a respected international resource for over forty years, Ornament encompasses the world. From the beginning we set ourselves the exciting challenge of documenting the art and craft of personal adornment. Ornament demonstrates the richness and diversity of this vast subject with a stunning display of creative works, past and present. With informative profiles we support emerging and established artists in jewelry and wearable fiber who create artworks that stimulate, enrich and invigorate us today and are a profound and exquisite legacy for the years ahead. Knowledge shapes the present and future when we renew our bonds both with the recent past and antiquity, revealing or tracing historical roots and customs, aesthetics, materials, and technical processes. Ornament exists to educate, inform and inspire. We invite you to join Ornament as we embark on a rewarding journey of discovery. Add your vision to ours. Together we will make this world a little more meaningful, a little more beautiful, and a little bit better.